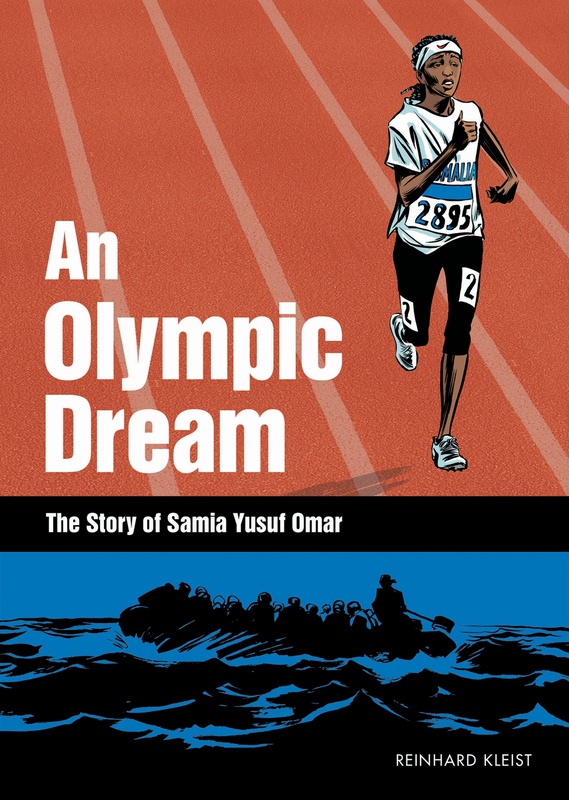 In the 2008 Olympic Games, Samia Yusuf Omar represented Somalia in the women’s 200 metres as the only female athlete from the war-torn country. She finished last. However, in doing so, she received a thunderous ovation from the hugely supportive Beijing crowd. Upon returning home, Samia only had one dream; to return to the Olympics in 2012 in London, not as a “novelty”, but as a fully-fledged athlete with a legitimate chance of winning. As a teenage girl in Mogadishu however, Samia’s dream seemed like an impossibility. Facing threats of violence from local militants who continually and aggressively remind her that “running is not for women” as well as an institutional sexism thwarting her attempts to access better training facilities, Samia makes the dangerous decision to try and make her own way to Europe, following in the tragic footsteps of so many of her other countrymen who went searching for a better life. Writer and artist Reinhard Kleist gives a moving sense of perspective to the European migrant situation, providing a harrowing account of Samia’s desperate but ultimately tragic attempt to make it to Italy. Throughout her journey, Samia was sporadically able to stay in touch with her friends and family via Facebook, and while the posts have since been deleted, Kleist uses a little artistic license to recreate them here – with the exception of one particularly moving post which is presented in its original form. The artwork is natural and fluid throughout, managing to capture the emotion and the flow of the story without needing to be overly detailed. Bold brush strokes convey a sense of movement as Samia runs, and the churning blackness of the ocean in the final pages provides a genuine sense of menace without anything having to be exaggerated. There’s something particularly touching about the purity of Samia’s motivations, too. Bereft of cynicism or any sense of personal gain, all she wants to do is run in the London Olympics and represent her country with pride. It’s a profoundly moving sentiment that resonates deeply as her journey unfolds with a gut-wrenching sense of inevitability. We know how this story ends, and we know that – in spite of the widespread media attention given to her – that the very same thing is still happening to this day, as displaced, terrified and desperate people risk their lives for the chance at a better life. Migration is an incredibly emotive issue, and there can be a horrifying tendency – particularly in the media – to characterise these people, whether they be refugees or immigrants, as faceless statistics. Thankfully, Kleist does a truly impressive job of portraying the humanity of their plight, illustrating the struggles and motivations of these people, people who are willing to endure such hardship and uncertainty for the faintest hope of a better life. Kleist reminds us however that it’s important to remember that, even though Samia’s story is particularly moving, each and every person who risks their lives on a journey like this has a similar story. Each of them are real people with real hopes and dreams, and the way Kleist portrays Samia’s fellow travellers in this story is a true testament to that. While AN OLYMPIC DREAM is a fairly difficult read at times due to the inherent tragedy of the story, it’s also an incredibly important one, and adds some much-needed humanity to what can otherwise seem like a faceless problem. Highest of recommendations for this one, and another glowing testament to the intelligent and thought provoking work of SelfMadeHero. More information about this release, including where to get your hands on a digital or print copy, can be found on the SelfMadeHero Website.